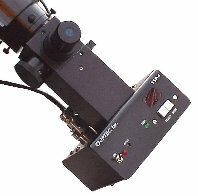 For several decades amateur astronomers have been providing valuable scientific data in collaboration with professional astronomers using Optec's SSP Single-Channel Stellar Photometers. The technology is proven to be capable of millimag accuracies with amateur level telescopes and mounts. An SSP photometer will allow you to contribute collaborative astronomical data to the greater scientific community through groups such as the AAVSO, IOTA, ALPO and others. Amateur astronomer Pat Rochford presents his experiences with the SSP-3 on the Cloudy Nights forum: https://www.cloudynights.com/item.php?item_id=2881. Now in it's second generation, the SSP-3 Gen2 has been upgraded with PIC microcontroller technology and direct computer serial interface and is now referred to as Generation 2. Click here for more information or to order the SSP-3 Solid-State Photometer. The SSP-4 NIR Infrared photometer uses an InGaAs PIN photodiode detector and is the first off-the-shelf infrared photometer available to amateur and professional astronomers. This instrument allows accurate measurements of very cool stars in the J and H standard photometric bands. A dual stage Peltier cooler keeps the detector at a preset temperature down to -40 degrees C. This instrument was developed in association with the AAVSO. Recently re-introduced in as the SSP-4 Gen2, automated single channel NIR photometry is now possible with most amateur level telescopes and mounts. 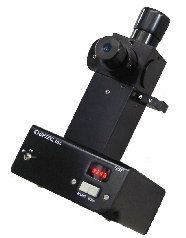 Click here for more information or to order the SSP-4 NIR Infrared Photometer. The SSP-5 PMT-based (photomultiplier tube) single channel photometer provides greater sensitivity than the SSP-3 and faster response time for occultation measurements. The SSP-5 has nearly 5 magnitudes greater sensitivity compared to the SSP-3. Using an optional extended red-sensitive PMT and Optec filters, the SSP-5 and SSP-5A can provide accurate photometric measurements in the Johnson U, B, V and R bands. Optec also stocks filters for the Strömgren u v b y bands. Like the SSP-3, the second generation SSP-5 Gen2 has been extensively upgraded with PIC microcontroller technology and a direct computer serial interface. 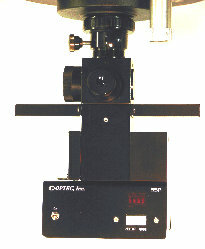 The SSP-5 can also be ordered with the optional motorized SSP-5A version with 6-filter slider for robotic operation. Click here for more information or to order the SSP-5 PMT photometer. SSP-3 Photometer Equipment Review by amateur astronomy researcher Pat Rochford.